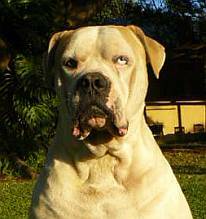 The American Bulldog has originated from an "English" or "British" Bulldog, (as they are sometimes called.) But there are only a few similarities between them. The American bulldog is far more athletic than the English Bulldog. The American bull-dog is said to be more like the original bulldog, which was bred for fighting. The British bulldog changed because breeders favoured a shorter-legged dog. 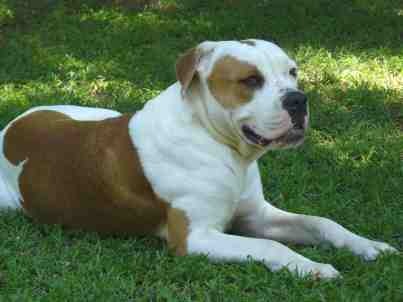 American Bulldogs were also used for hunting purposes and guard dogs on farms. How breeds of dogs developed. 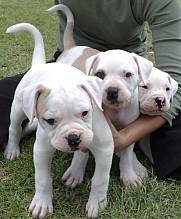 Being a new breed in South Africa, the American bulldogs are appraised annually by ABASA (American Bulldog Assoc. of SA) There is always more than 40 dogs together with owners that don't do any special training with them, and it is amazing to experience that not one dog shows any aggression towards another dog or person. Colour: white, white with brindle markings, or white with tan markings. The bow-legged, sag-backed English bulldog waddles around, but the athletic American bulldog runs! A well-trained dog can be given freedom to run around. He is obedient and will obey his master's command to go the way the master wants. We humans, if we obey our divine Master, have a freedom and a joy of pleasing God. Like king David of Israel sang, "I run in the path of your commands, O God, for you have set my heart free!"